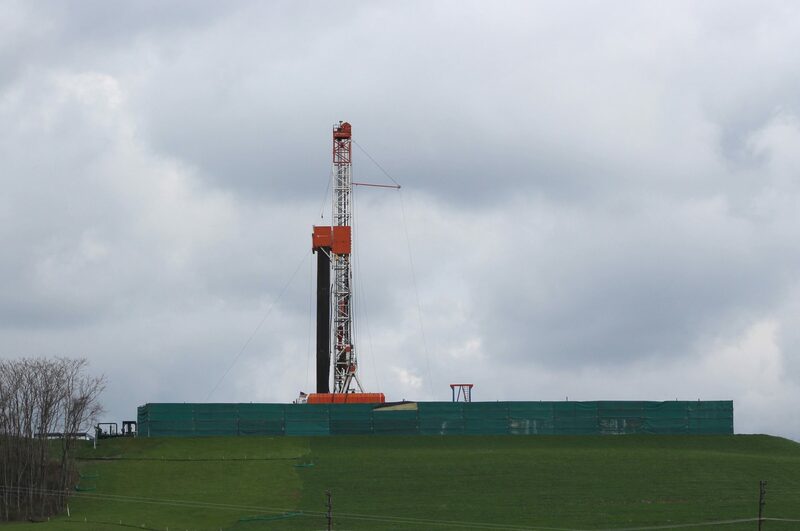 A shale gas drilling rig in Washington, Pa. Some Pennsylvania lawmakers are introducing legislation, again, to impose a severance tax on natural gas production. The Legislature has debated enacting such a tax for a decade. Several lawmakers joined Gov. Tom Wolf on Monday to announce their latest effort: a pair of bills that propose a tax ranging from 4 to 7 cents per thousand cubic feet of gas, depending on the price of gas. The bills, Senate Bill 1000 and House Bill 2253, reflect the plan the governor outlined earlier this year in his proposed budget. Wolf’s plan would raise more than $200 million in the next fiscal year, according to estimates from the governor’s office and Pennsylvania’s Independent Fiscal Office. “We’re proposing a reasonable severance tax in line with other gas-producing states where energy pays its fair share,” he said. The governor said the tax would be imposed in addition to the state’s impact fee, which gas companies pay for each well they operate. The fee has generated more than $1 billion since it went into place several years ago. Much of the money is distributed back to communities impacted by gas development. A severance tax would be different, requiring companies to pay based on the volume of gas produced at each well. Every major oil- and gas-producing state except Pennsylvania has such a tax. But a potential severance tax here continues to face opposition from Pennsylvania’s gas industry. David Spigelmyer, president of the Marcellus Shale Coalition, said that to grow the economy, the governor should instead focus on creating jobs in building trades and manufacturing. “Governor Wolf claims to support energy workers and small businesses, yet he again proposes to smother this important growth sector with additional job-crushing energy taxes,” Spigelmyer said in a statement. Past efforts to pass a severance tax through the Republican-controlled Legislature have been met with little success. The Senate advanced a bill last year, but no measure has ever made its way to the governor’s desk. In introducing the latest severance tax legislation, Wolf was joined Monday by lawmakers from both parties: Sen. John Yudichak, D-Plymouth Township; Sen. Tom Killion, R-Middletown Township; Rep. Bernie O’Neill, R-Warminster Township; and Rep. Jake Wheatley, D-Pittsburgh. Killion’s district includes numerous municipalities where construction of the Mariner East 2 pipeline is taking place. He said when lawmakers imposed an impact fee to send money to communities affected by drilling, they overlooked areas outside the gas fields where pipelines would be built to carry the gas to market. “This is an opportunity for us to provide revenue that can benefit all Pennsylvanians,” Killion said, echoing remarks from the governor that money collected from a severance tax would help fund education and better roads throughout the state. The bills also contain several reforms to the well permitting process, including a longer three-year window to drill a well, allowing a single application to cover multiple wells on one well pad and letting the location of a well differ by up to 50 feet from the spot listed on its application.